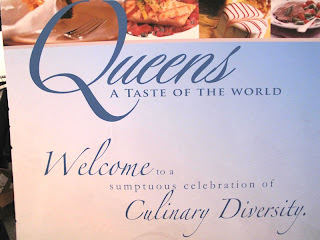 Queens is one of the most diverse areas in the world; so, it was a no-brainer that Jaquie and I had to attend this year's Taste of Queens event where dozens of Queens chefs gathered in Citifield to prepare samples of their restaurant's most celebrated fare. Though Italians seemed to rule the floor, a few Latin restaurants showed face and stood their ground. First off was La Rosa Nautica (90-16 Corona Ave/718-592-0482), which is owned by Peruvians who position it as a restaurant of international Latin cuisine. La Rosa served up a seafood soup, which was good but not outstanding. However, we knew the next item would taste great because people were asking for seconds and complementing the chef. 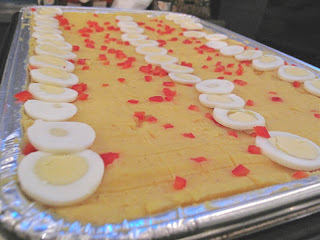 Mescla a la Nautica (Nautica style Mix) is a savory mix of creamy chicken, beef, and veggies mixed in layers of a very unique mashed potato mix topped with slices of hard-boiled eggs. This was one of our favorite tastes of Queens. The owner mentioned that it was an original creation specific for the Taste of Queens event. I was disappointed to find that they didn’t have a website. Hopefully they’ll get one soon. The next Latin station was occupied by two young and enthusiastic Argentinian guys representing La Fusta Restaurant and Steakhouse (80-32 Baxter Ave/718-429-8222) and Don Francisco Meat Market (85-17 37th Ave/718-505-5892). As mentioned in last week's post, Argentinians are serious about their meat. We tried the choripan which is Argentina's national street food. It's simply sausage on bread topped with chimichurri sauce. As one of the guys explained, chimichurri is a very personal element of Argentinian culinary life. No one chimichurri is the same yet everyone believes theirs is the best. It symbolizes the pride of the Argentinian spirit. CHE! Don Francisco! Your's is definitely the best. 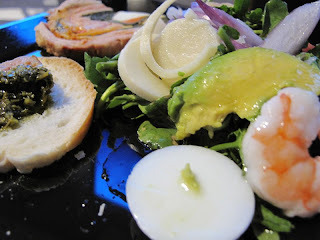 In addition to choripan, we had a tasty seafood salad and matambre (hunger killer), which is rolled beef stuffed with hard-boiled eggs, vegetables and various herbs and spices. It's a great appetizer because it's cold and lean, leaving room for the hefty steak entrees that tend to follow. Sadly enough there were no samples of steaks but maybe that was their tactic to tease the guests for the next level. Your marketing tactic worked on us guys. We'll be there in a couple of weeks for sure. Most impressive were the delicate tasting samples from Marbella (220-33 Northern Blvd/718-423-0100) who offered carnes con setas del bosque (beef made in it’s own sauce with mushrooms) and pollo en piquillo (chicken in pepper sauce). The beef and chicken tasted absolutely exquisite despite their ordinary look. You almost tasted the years of experience it takes to master these common dishes. Their salpicon (seafood salad) on the other hand looked as delicious as it tasted. Jaquie went back for seconds and I convinced her that thirds would be ridiculous since there were about 20 other booths that we had not visited. Eventually we went back for thirds. My tastebuds were overwhelmed with all the different types of food and my stomach expanded to twice its size but my smile was permanent. We were in the new home of the Mets (I'm a big fan) and there were food and drinks everywhere. 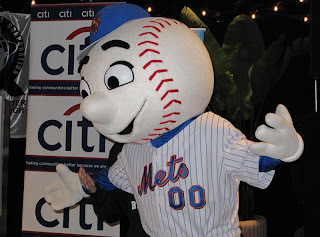 The non-food highlight of the evening: Mr. Met pushing a Yankee fan behind him after he tried taking a picture with him. Let's Go Mets! Unfortunately, Tequila Sunrise ran out of food by the time we arrived and Mitad del Mundo was a no show. Though not exactly Latin, I must mention our favorite bite of the night and winner of the best appetizer. Courtesy of Bantry Bay Pub, we had the pleasure to taste almonds stuffed in dates wrapped in bacon. I wrote about this only because it's one of the most amazing bites I’ve ever tasted. The truth is... you should try to eat Argentinian food if you haven't yet. Trying to relive my trip to Buenos Aires, I suggested to my cousin Carol that we put together an Argentinian style feast. Argentinians are masters at soccer, tango and best of all the art of cooking steak. Until this day I have not found a culture that prepares steak better. Though it’s very difficult to duplicate the steaks in Argentina, my cousin did a pretty damn good job at bringing these skirt steaks to par. While the food was being prepared, Jaquie put together original Sangria. It's made with 2 bottles of Red wine, 2 shots of Brandy, 4 cups of club soda, 2 oranges, 2 lemons and 2 apples. The fruits are chopped into chunks and dropped in the mix. Make sure you squeeze the oranges and lemons before you add them to the beverage. Add sugar to taste and Voilà ! The Sangria did wonders at taking our minds off the smell of lunch but we still needed something to munch on so I decided to grill the Provoleta early. Provoleta is simply Provolone cheese cut a half inch thick topped with dry oregano and grilled until the top and bottom are browning. It really takes skill at mastering the timing which was proven by the fact that I burned the first one. Luckily Jaquie will eat anything burnt. A very handy trait to have around an amateur cook. I tasted Provoleta in Buenos Aires and thought it was genius. It's a great way to build up an appetite for a juicy steak. I was also in charge of the Chimmichurri sauce which I got from epicurious.com. I usually try to find recipes written in Spanish because I feel the more old school, the more authentic. 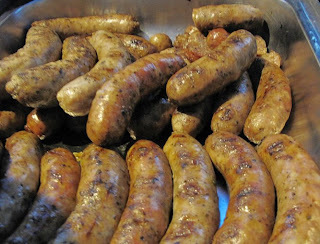 But I found such a variety of recipes that I figured I would give this well known site a try. It came out really good even with the extra garlic clove. Enough to deserve drenching the plate. Realizing that Argentinian empanadas would be very time consuming, we opted for patacones more commonly known as tostones (flattened green plantains) which are traditionally served in the Caribbean and the Northern part of South America. Additionally we had some ribs that fell right off the bone, two different kinds of rice and some homemade Mango salsa which paired lovely with the tostones. We enjoyed the rest of the evening finishing the sangria and playing cranium. All agreed that every element of this home cooked meal was delicious. If you don’t believe me ask Puma, my cousin’s hairless cat. She was sneaky enough to steal a piece of meat from the kiddie table. I didn’t know cats ate steak. According to the census, Ecuadorians have surpassed Colombians as the largest South American group in New York City and are rapidly catching up to Mexicans. Have you ever tasted Ecuadorian food? Ecuador is nestled in between Colombia and Peru so naturally the food incorporates elements of both countries plus their own to create unique flavors. Last Sunday after playing soccer and kickball with friends (regressing is so much fun), we sorely stumbled to Barzola, an Ecuadorian restaurant recommended by my former roommate Paul who was raised in Ecuador. Being the perfect judge of authenticity, he rated Barzola a 9 out of 10. The service was shoddy at first, shown by the sheer fact that it took more than an hour to get a glass of water. Thankfully, the manager stepped in excusing our waitress, who was struggling on her first day, and offered the whole table free mojitos and piña coladas on the house. We appreciated the very nice gesture, but the tension had already faded as everyone took their first bite. Overall the food was scrumptious. Jaquie and I split humitas (corn pie with cheese) and ayacas (shown above). The ayacas were like nothing i've ever tasted before. It’s a tamal made with sweet plantain dough and filled with a variety of ingredients such as beans, peas, and olives. It is very sweet and mouthwatering even though it looks salty. Though sweet, it was properly placed on the appetizer menu. Very Appetizing! Jaquie ordered the ceviche, which is very typical in Ecuador, especially on the coast. It was a cold mixture of seafood, lime and onion extravaganza. Ecuadorians definitely know how to make a succulent ceviche! I also tasted a warm ceviche, which was good but did not seem natural. You may want to ask if your ceviche is cold or warm when you order. I ordered the most typical Ecuadorian plate, seco de gallina. It translates "dry of hen" which I never understood because it's always quite moist and even soupy, for that matter. Some of my most comforting dishes involve some moist chicken drenched with tasty sauce that I could soak up with rice. However, while this was really tasty, the chicken could have been seasoned better and wasn't as moist as I expected. It actually lived up to its literal name, seco. Paul's brother-in-law ordered a rice plate that resembled Chinese fried rice. He did not recognize it as Ecuadorian and the name escapes me but it was good, and I'm still left wondering how it landed on the menu. If anyone knows the name of this dish, please leave a comment. Curiosity killed the foodie. Lastly, Paul's father ordered the most interesting dish, a Bandera (Flag). I look forward to someday acquiring a taste for this dish. Bandera has ceviche on top of yellow rice, seco de chivo (dry of goat) and Guatita (tripe stew). His big smile said it all; so if this sounds like your cup of tea, you should definitely try this dish. Something tells me that Ecuadorian food will be recognized widely in the near future. Get a head start and check out Barzola. If you feel more comfortable venturing into Brooklyn, there's a Barzola in Williamsburg as well. Jaquie and I woke up last Sunday with an urge to dive into the trenches of Jackson Heights in Queens, NY. We paid homage to the brave Mexican and Colombian souls that left everything behind to pursue the American Dream, especially the cooks and street vendors. Jackson Heights, my old stomping grounds and the first stop for many Latin American immigrants, is filled with enough Latin eateries to keep this blog alive for a decade. We started on the corner of 81st and Roosevelt Ave where there's a lady grilling elotes in a shopping cart. Elotes are corn on the cob Mexican Style. Corn is originally from Latin America and is the main ingredient for a lot of Latin foods. My elote had everything on it: mayonnaise, butter, chili powder, crumbled Mexican cheese, and fresh limejuice. Jaquie just excluded the mayo. I've had sweeter corn, but the combination of ingredients made for a great start to the feeding frenzy. Next stop, a walk-up Colombian establishment, Los Chuzos y Algo Mas, located on the northeast corner of 79th street and Roosevelt Ave. The name translates to Skewers and Something Else; in this case, the something else was typical Colombian fruit juice. Though guanabana (soursop) was on the menu, I decided to go with mora en leche (blackberry milkshake). Jaquie had the pineapple juice that seemed to disappear like any other drink that has ever been at her arms length, given her habit to drink very fast. Colombian juices are made from a wide variety of fruits, some of which are not well known in the US. The less known ones are guanabana, tomate de arbol (tamarillo), lulo (no translation). Reason enough to visit paradise. The chuzo (meat on a skewer) was marinated mainly with cilantro and lime. The meat was tender and will take down the typical New York shish kebab any day of the week. It's served with a small arepa and tasty on its own; yet we couldn’t resist drenching it in hot sauce and golf sauce, which is just ketchup combined with mayonnaise. We Colombians are obsessed with mixing mayo and ketchup. On the way back we decided to try the tacos at Taqueria Coatzingo 40-18 82nd street. Loaded with guacamole and served with delicious chips and great salsa. The tacos scored a 7 out of 10 on Jaquie’s authenticity scale. I give them two guac-covered thumbs up. We split a glass of Horchata, a cold drink made from rice, almonds, cinnamon and vanilla. It made Jaquie smile like a kid in a candy store, clearly scoring a perfect 10. Overall we spent about $24. We barely even touched the tip of the iceberg on Roosevelt Avenue. Definitely much more to explore! Where’s your favorite latin food street vendor? ?